Planning on starting your own web hosting business? Congratulation! You’ve landed to the right page. Most of the leading IT ventures of the valley got kickstarted with a promising client-based service. And right now, maybe your potential customers are suffering from the crisis of an affordable and promising hostings service. So, it’s your golden chance to introduce your own hosting service and approach to build your own brand. Find your desired web hosting reseller packages from zHost Bangladesh. All are premium quality SSD reseller hosting yet with affordable price. To kickstart your journey, zHost reseller hosting plans are always by you! Reseller hosting (also called White Label hosting) is basically when you’re allocated certain disk spaces and other hardware and you customize that in your own way. Later on, you can start building your own brand with a number of hosting offers for your individual clients. No extra cost of software, hardware, uptime and more. From WHM to free billing software- you get it all for free. Anytime upgrade and downgrade facility. Most importantly, you can host websites yourself as if it’s your own company! Resellers of a professional hosting network can market their hosting resources as if it’s they are the owner themselves. With the given share of hard drive space, bandwidth and other technical facilities, you can look forward to create your own brand. We allow you to create your own branding Name Server. Also you are free to have dedicated IP address for reseller account. What Makes a Reseller Hosting Provider Awesome? Hundreds of international brands come up with even thousands of offers and packages. So, it’s pretty hard to determine what actually makes a hosting provider best in the game. Super-fast premium (SSD) disk space. Excellent uptime with top notch hardware. Full flexibility of resource allocation for clients. To let your customers control their own cPanel. A set of reseller-friendly tools (i.e. WHM, billing software etc.). Very competitive price in compare to market value. 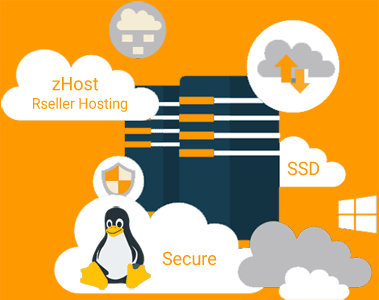 The good news is, as the best reseller hosting in Bangladesh, zHost got it all for you! We provide special privileges of high quality servers to our hosting resellers. Intel Dual Xeon 16 Core (32CPU) processor, 64GB DDR4 SSD RAM, Server side separate backups system, multiple hard disk drive and high speed outbound bandwidth- that’s what our own server is consisted of. More or less, it’s the industry leading hardware as far as we are concerned. zHost Bangladesh gives you ample opportunity to customize your own domain and hosting business. We allocate a certain space within our servers and rest of the game is up to you. A full-features cPanel is there for you to create and modify all your client’s websites. Besides, a number of browser-based application will make your reseller life easier. If you become a brand owner with our reseller hosting packages, you need to be extremely supportive to your clients. No matter how silly or serious the issues are, you can’t say NO as an answer. And to back you up in the industry, we are always here. Our technical experts are in a 24×7 helpline just to hear from you. Your client’s problems are your trouble, and your trouble is our first priority to resolve. Our care about our client’s hard-earned investment reflects in our competitive price ranges. We offer four different reseller packages- Personal, Business, Large and Mega Resellers. Each of them has their own range of excellence. Starting from rookie entrepreneur to big fishes of the business, we have always got something to offer. In an additional note, in the race of being affordable reseller hosting Bangladesh, we don’t compromise our service standard. Instead, we believe in a mix of affordable price and top-notch service. We do not offer cheap web hosting services. we haven’t seen our resellers asking for refund yet, but we have a 100% moneyback guarantee. It validates for first 30 days of the purchase and works for each of our reseller packages. You will be asked no question. Moneyback guarantee works like ask and get refund. We offer fully branded domain reseller account with our hosting reseller packages. You will not only get hosting reseller but also domain reseller price. You don’t have to pay extra money for domain reseller account, plus have huge discount on domain price.